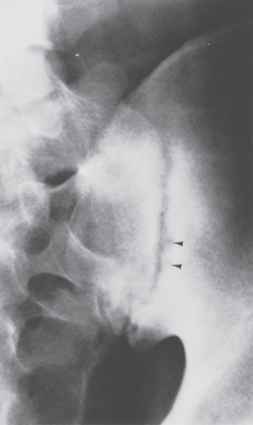 The spondyloarthropathies are a group of multisystem inflammatory disorders that affect predominantly the spine but also other joints and extra-articular tissues. Most are linked to the HLA-B27 gene, but HLA-B27 by itself does not explain the development of these diseases; pathogenesis of these conditions is still unknown. They include ankylos-ing spondylitis, reactive arthritis (Reiter's syndrome), pso-riatic arthropathy, enteropathic arthropathy, juvenile-onset arthropathy, and undifferentiated spondyloarthropathy. Both genetic and environmental factors probably contribute to the onset and progression of these diseases. Most people with HLA-B27 do not develop these diseases, and these diseases occur in the absence of HLA-B27. 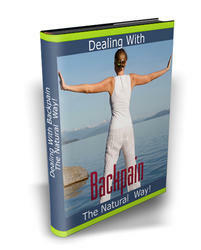 • Back pain and progressive stiffness are primary symptoms of this chronic inflammatory disease of axial skeleton. • The male predominance for ankylosing spondylitis is 5:1. • Clinical history, physical exam, and radiologic findings are key to AS diagnosis. Primary or uncomplicated ankylosing spondylitis (AS) is a systemic inflammatory disorder predominantly affecting the sacroiliac joints and the spine. Patients with secondary AS have inflammatory bowel disease (IBD), psoriasis, or Reiter's syndrome in addition to their arthropathy. Hip and shoulder joints may also be involved in AS. Inflammation occurs at the intervertebral disk's annulus fibrosis-vertebral bone margin. This area is replaced by fibrocartilage and then ossified. Progression of this process results in the classic vertebral fusion known as bamboo spine; this ankylosis is a very late finding. Inflammation also occurs at the sites of ligament and tendon attachments (enthesitis) in the spine and pelvis, which become ossified. Ankylosing spondylitis usually affects men (male/female ratio 5:1) in their 20s and 30s. It often manifests as vague, somewhat diffuse low back pain, felt generally in the buttocks or sacroiliac area but often in the lumbar area. Pain becomes more persistent and bilateral. Back stiffness after inactivity, such as on awakening, becomes more predominant and is relieved by activity or a hot shower. AS can also disturb sleep, leading to complaints of fatigue, and can be associated with systemic symptoms such as malaise, low-grade fever, and weight loss. Symptoms can be subtle, but AS should be considered if back stiffness or discomfort persists, is relieved by exercise, and occurs in a man younger than 40 years. In juvenile-onset AS, hip and shoulder symptoms might predominate first, whereas in adult AS the back is usually the first affected area. Disease progression is highly variable and can be mild and self-limited or can cause disability. The two most common techniques to detect AS are palpation of the sacroiliac joints and assessment for spinal mobility. Decreased mobility early on is usually caused by pain and muscle spasm rather than by ankylosis. Flexion, hyperextension, axial rotation, and forward flexion should be assessed. 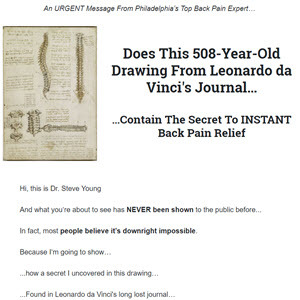 Over time, the spine becomes increasingly stiff at an unpredictable rate, and stiffness might or might not eventually involve the entire spine. Other extra-articular manifestations of AS include acute uveitis (iritis), aortitis, and neurologic complications resulting from cervical spine fractures from even minor trauma. Diaphragmatic breathing and limited chest excursion can be seen as a result of costovertebral involvement. 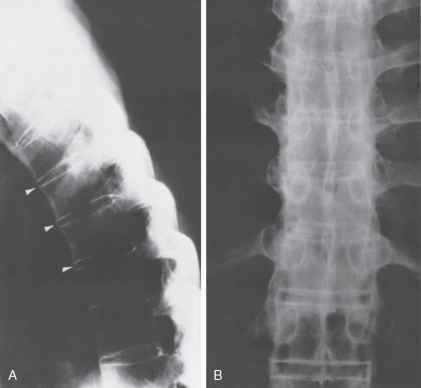 The earliest radiographic abnormality can usually be seen in the sacro-iliac joints, with sacroiliitis progressing to bony erosions and sclerosis (Figs. 32-13 and 32-14). These changes might also be seen at the sites of ligamentous attachments to bones. Bone scans, computed tomography (CT), and MRI should be used only if plain radiography does not confirm clinical suspicion of AS. From 70% to 80% of AS patients report substantial relief of their symptoms with NSAIDs, the mainstay of AS therapy (Song et al., 2008). Continuous NSAID use may decrease radiographic progression of the disease (Ward, 2005). However, the benefits must be weighed against the risks associated with prolonged NSAID use. Corticosteroids have not been shown to be helpful. Physical therapy focusing on strengthening of back extensor muscles might improve functional status and, at the very least, help maintain an erect position if spinal ossification occurs (Dagfinrud et al., 2004). Patients should be encouraged to walk erectly and to keep the spine erect as much as possible, sleep on a firm mattress with the spine extended, and swim for exercise. Splints and braces do not help. A home exercise program is better than no intervention for AS patients, and supervised group exercise is better than home exercise. Combined inpatient spa treatment and exercise (group physical exercises, walking, correction therapy, hydrotherapy, sports, sauna), followed by supervised outpatient weekly group physiotherapy, is better than weekly physiotherapy alone (Dagfinrud et al., 2004). global, pain, and functional assessment and reduced inflammation, based on morning stiffness (MacLeod et al., 2007). Sulfasalazine in general is only used for peripheral AS. Meth-otrexate, sulfasalazine, and leflunomide are ineffective for axial disease of AS. NSAIDs are the recommended initial therapy for ankylosing spondylitis (Song et al., 2008) (SOR: A). Patients with AS should initiate an exercise program (Dagfinrud et al., 2004) (SOR: B). Systemic glucocorticoids are not recommended for AS therapy (SOR: C). For AS patients with axial disease who do not respond to NSAIDs, anti-TNF therapy is recommended (MacLeod et al., 2007) (SOR: A). • Signs and symptoms of reactive arthritis develop within 1 month after a genitourinary or gastrointestinal infection. • Chlamydia infection or common enteric bacterial infections are the primary cause of Reiter's syndrome. • Only one third of patients with reactive arthritis will present with the classic triad of urethritis, conjunctivitis, and arthritis. (and possibly pulmonary) infection. The arthritis often occurs after the urethritis, uveitis, or gastroenteritis has resolved. The classic triad of nongonococcal urethritis, conjunctivitis, and arthritis is fully present clinically in only one third of patients. Reactive arthritis occurs secondary to Chlamydia trachomatis and possibly Ureaplasma urealyticum urethritis. Urethri-tis is sometimes asymptomatic or, in male patients, might manifest not with a mucopurulent discharge but rather with gross hematuria secondary to a hemorrhagic cystitis. Neisseria gonorrhoeae infection does not cause reactive arthritis, but a septic joint, including that from gonococcal infection, must be ruled out. GI infections caused by Shigella, Salmonella, Campylobacter, Klebsiella, Clostridium, or Yersinia can all lead to reactive arthritis. By the time the gastroenteritis has resolved and arthritis has developed, the inciting bacterial agent cannot be cultured from the stool. Pulmonary infections with Chlamydia pneumoniae might also cause the disease (Braun et al., 1994). Conjunctivitis occurs at the same time or several days after the arthritis, if it occurs at all. The relationship between Reiter's syndrome and HIV infection is most likely caused by HIV's association with Chlamydia and enteric bacterial infections rather than by HIV itself. Two thirds of patients with reactive arthritis are HLA-B27 positive, indicating genetic factors as well as infectious causes. Reactive arthritis usually affects several joints, most often in the lower extremity (knees, ankles, feet). Common sites are entheses (where ligaments attach to bones), in particular the Achilles tendon attachment, which causes heel pain. Extra-articular manifestations of reactive arthritis include oral ulcers, aortitis, keratoderma blennorrhagicum (a pap-ulosquamous skin rash occurring most commonly on the palms and soles), and balanitis circinata. Reactive arthritis usually resolves within 1 year. Although there is no cure, the underlying illness should be treated. When Chlamydia is suspected, patients might be given doxy-cycline or an analogue for up to 3 months, but the optimal duration of therapy is unknown (Mandell et al., 2004). Antibiotics might limit recurrences as well as shorten the course after an episode of urethritis; however, antibiotic use following enteric infections has not been shown to affect the course of reactive arthritis. Reactive arthritis is treated with NSAIDs or intra-articular corticosteroid injections acutely and subsequently with sulfasalazine, 1 g two or three times daily, or methotrexate, 7.5 to 25 mg weekly. No specific studies using anti-TNF therapy have been done, but antidotal research indicates it may be helpful. Long-term disability is uncommon but is usually caused by chronic foot or heel pain or vision problems.